SALEM – A little girl fighting for her life got some help from a concerned police officer. 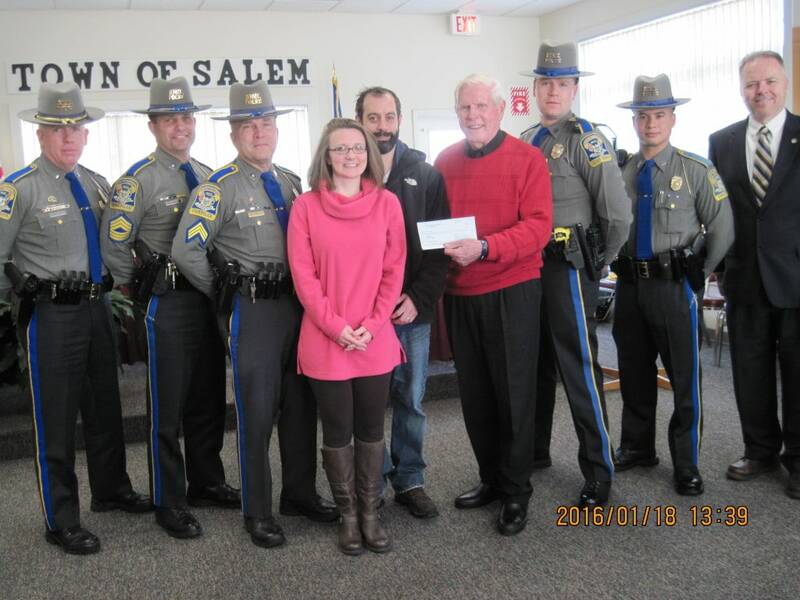 Salem Resident Trooper Christopher Pariseau recently was told about a little girl that was fighting cancer, and he wanted to help. The head of the Salem School Parent Teacher Organization, Christina Rebelo, told Pariseau about Brynn Levitsky, and how she is undergoing treatment for cancer for the third time. Help Brynn WinBrynn was diagnosed with leukemia for the third time in October, just two months before her fifth birthday, and has been receiving treatment at Yale-New Haven Hospital. Brynn was first diagnosed at just 22 months old, and remained cancer free for just over a year before she was re-diagnosed in May 2014. Brynn’s family has been struggling financially with all the medical bills and daycare for her sibling, and the financials became more difficult when her mother had to quit her job to take care of Brynn. Rebelo, who is also the program director for a nonprofit called Massachusetts Law Enforcement Support, told Pariseau about Brynn, and also about a charity she was familiar with called Cops for Kids with Cancer. That charity is based out of Braintree, Massachusetts, and is chaired by the former superintendent in chief of Boston Police, Robert Faherty. Pariseau contacted Faherty about Brynn’s story, and he advocated for her to the board of directors at the charity. On Monday, Faherty and the Cops for Kids with Cancer charity presented Brynn’s family with a $5,000 check to help with the medical bills. Brynn is still fighting, though she got some good news recently! According to the Facebook page dedicated to her journey, Help Brynn Win, a PET scan taken at the end of December showed the mass in her chest was gone, and though she has chemotherapy to complete she’s on the road to recovery.